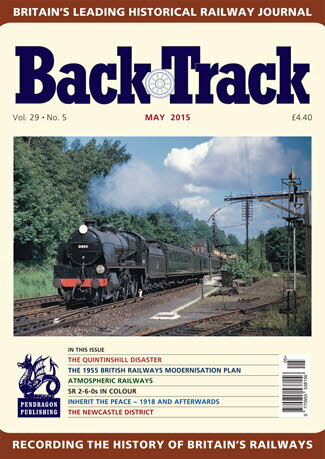 Railway Magazine | BackTrack May 2015 journal from Pendragon Publishing. 'Putting New Heart into Industry' - Geoffrey Skelsey considers the origins and outcomes of the 1955 Modernisation Plan. The Stonebridge Branch - Peter Butler explores a briefly significant but now largely forgotten line in Warwickshire. Mr. Maunsell's Moguls - four colour pages of the Southern N/N1 and U/U1 Classes. Quintinshill - Stephen Roberts acknowledges the centenary of Britain's worst railway accident. Inherit the Peace - Part One - A. J. Mullay looks at the 1918 Armistice and its effect on Britain's Railways. Branches in all parts of the Country - three colour pages of branch line scenes throughout Britain. The Devon Valley Railway - Alistair Nisbet presents the history of the Alloa-Kinross branch. On the Great Western Route North - archive photos of the GWR main line to Birmingham, Shrewsbury and Chester. Out and about on the Ribble Valley line - colour spread by Tommy Tomalin on the Blackburn-Hellifield route. Newcastle District - Part One - Michael B. Binks describes the Railway Civil Engineer's work in the North East. It seemed like a good idea at the time - Part One: Atmospheric Railways - Miles Macnair investigates some early alternatives to the steam-hauled railway.